Growing pains are very common in children and do not seem to have any specific physical cause. They are pains that cause ache and cramping in the muscles in the limbs (most commonly the legs). 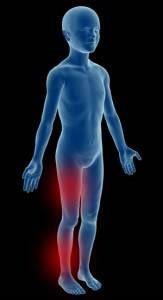 Generally pains are felt in the fronts of the thighs, in the calves (back of the legs) or behind the knees. This can differ between children. Sometimes there is a large amount of pain and other times it is mild. The pain comes and goes and can be present for months to years. Most kids outgrow growing pains within a few years. The most common pattern is for the pain to start in the late afternoon and evening. The leg pain can sometimes hurt so much that it will wake your child from sleep. Pain disappears in the morning and generally will not interfere with their sport and activity during the day. There is no firm evidence to show that growing pains are linked to growth spurts. Growing pains are commonly linked to activities that can wear your children’s muscles out such as: running, climbing and jumping. Diagnosis – If you think your child may have growing pains, it is important for them to see the doctor to rule out any other possible causes of the pain. Speak to your physio – Your physio can show you different ways to manage growing pains. This can include stretching of the muscles before bedtime and when there is pain, gentle massage, and advice such as using heat such as a heat pack and pain relief (see your GP).